Days after it emerged that the organisation responsible for investigating police misconduct are unable to interview police officers who were involved in the shooting of Mark Duggan in Tottenham last year, campaigners are calling for the abolition of the Independent Police Complaints Comission (IPCC) and for a proper, citizen-led organisation to replace it. 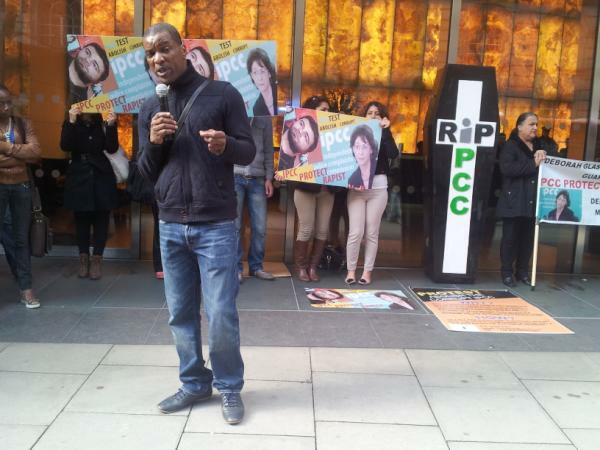 Over a hundred people, including family members of those who lost their lives at hand of the police, rallied at the IPCCâ€™s headqurters in Holborn, central London, yesterday. 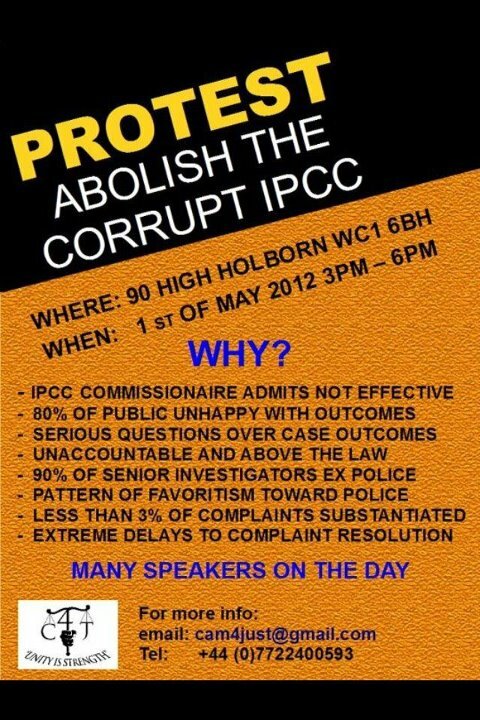 The May Day protest was held under the slogan â€˜Abolish the IPCCâ€™ and groups involved called for a full and public parliamentary enquiry into the IPCC and the wider police complaints system (see flyer at the bottom of this post). â€œWhilst it is clear that a system for police accountability is vital and required in law, the current conduct of the IPCC falls far short of what we should reasonably expect. There is mass dissatisfaction from those people who have turned to the IPCC for help and complaint outcomes are of serious concern. Our view is that it appears both misconduct of the police and their criminal behaviour is regularly covered up. Most recent controversies involving the IPCC centre on the Mark Duggan case, whose death triggered the riots that rocked England last summer. Eight months after Duggan was shot dead by police, there is continuing uncertainty about why he was shot and in which circumstances. Community distrust of the IPCC started immediately after the shooting, as the watchdogâ€™s initial statement on Dugganâ€™s death included the falsehood that he had shot at police first, and that Scotland Yard marksmen at the scene had acted in self-defence. When this turned out to be untrue, the IPCC apologised over what many in Tottenham regarded as a blatant lie. Eight months after Duggan’s death, the police officers involved have provided short, written statements, but none has been interviewed. This is highly controversial since there are doubts about the ways in which the IPCC handled several key bits of evidence, particularly why the minicab in which Duggan was travelling was removed from the scene by the IPCC, only to be returned later, and why the gun alleged to be Dugganâ€™s was found 14 feet away from the scene, on the other side of a fence. Police had stopped Duggan in Ferry Lane, between Tottenham and Walthamstow, an area without active CCTV cameras. The IPCC only has the power to summon police officers when they suspect the officers in question of having committed a crime. In the Duggan case, the IPCC seems to have been extremely reluctant to consider this option. 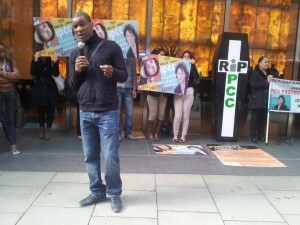 Â Last week, Tottenham community activist and race relations consultant Stafford Scott called for the IPCC to be given full powers to investigate the shooting. Scott, co-founder of the Broadwater Farm Defence Campaign, had resigned in November of last year from the community reference group set up by the IPCC to ensure local confidence in the investigation. He quit over the IPCCâ€™s handling of key bits of evidence, branding the investigation â€˜shoddyâ€™.Â It appeared that Scott no longer had any confidence in the investigation, and was compromising his position as community leader by being involved in it. In March of this year, the Duggan family heard that the earliest date for an inquest would be January 2013, but was also told that an inquest may never take place. A special inquiry may be held instead, as the IPCC are unable to disclose intelligence obtained by the police through phone-tapping under the Regulation of Investigative Powers Act (RIPA). It means that crucial part of the inquiry may have to be held behind closed doors, leaving Dugganâ€™s family to guess about the police intelligence that led to his death. Other cases where families are still in the dark over what happened to their loved one, or are unhappy about the outcome of the IPCC investigation, are those of Azelle Rodney, Sean Rigg, Jean Charles de Menezes, Smiley Culture, Dimitri Fraser, Sean Rigg and many, many others.